Two weeks ago, the Aspen Institute’s National Commission on Social, Emotional, and Academic Development published its long-awaited and much-vaunted, albeit slightly syntactically challenged, report: From a Nation at Risk to a Nation at Hope. The commissioners declare, “After two decades of education debates that produced deep passions and deeper divisions, we have a chance for a fresh start” — social and emotional learning. So far as educational fads go, SEL has distinct virtues. Like some of its predecessors, SEL sounds like the kind of thing no respectable person could oppose. After all, how could someone be against social and emotional learning? But unlike many of its predecessors, SEL is basically unfalsifiable. Reforms intended to improve reading and math achievement face an annual reality check from standardized tests; that’s how we know that reforms like the Common Core and test-based teacher evaluation did not work. But SEL outcomes are rarely measured and made public. So parents ought feel a touch of trepidation at the report’s call for “systemic change … it’s not a matter of tinkering around the edges. 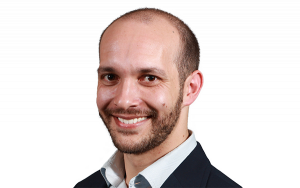 It requires fundamentally changing how we teach children.” And policymakers ought to look very closely at the particular policies being pushed under the umbrella of the report’s substantively ambiguous but rhetorically unambiguously virtuous recommendations. For example, the second of the report’s six recommendations is “Transform Learning Settings So They Are Safe and Supportive for All Young People.” But behind that apparently non-ideological and “evidence-based” exhortation is a recommendation that is neither: transition from traditional discipline to restorative practices. Unsurprisingly, the report highlights a high school from Washoe County, Nevada — a district that has gained national renown for its SEL initiative. On its “Research” page, the Collaborative for Advancing Social and Emotional Learning features a quote from Washoe Superintendent Traci Davis: “For us, it’s not about one more thing we have to budget for. SEL is in the blood of what we do in the district.” Washoe’s SEL initiatives have been favorably profiled at EduTopia and the RAND Blog, and Education Week made a short movie highlighting its success. One thing clearly sets Washoe County apart: In partnership with Panorama, Inc., it administers robust school climate surveys tracking a host of outcomes and makes school-level results public every year. Yet, somehow, despite all the attention lavished on Washoe County, no one appears to have checked the data. This isn’t a case study in SEL success. It’s a horror story. And it’s par for the course in Washoe County, since the school district adopted the approach to discipline that the commissioners’ report promotes. The following graphs show how student answers have shifted to a range of safety and SEL outcomes during two periods: 2012-13 to 2014-15 and 2014-15 to 2016-17. Schools that fall within the gray segment saw student answers shift less than 5 percent either way; schools in the orange segment saw a moderate deterioration of 5 to 15 percent; schools in red saw a major deterioration of 15 percent or more. At the beginning of the 2015-16 school year, Washoe County adopted the kind of discipline reform touted by the Aspen report. 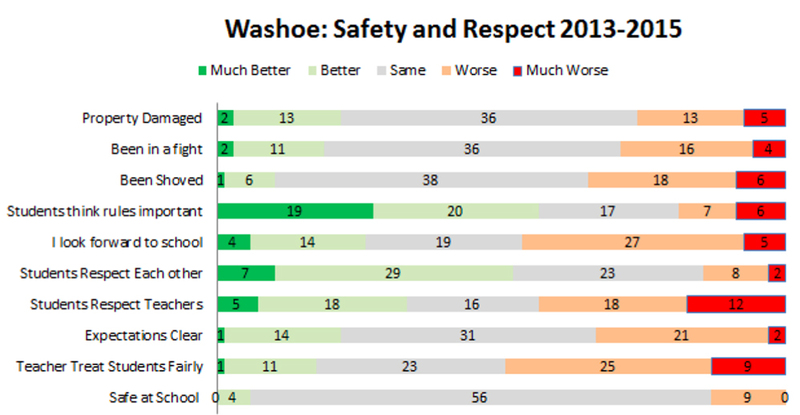 The pattern is unmistakable: Before the discipline reform was adopted, school climate in Washoe County held stable. After, it deteriorated dramatically. In the 2014-15 school year, Washoe started asking additional SEL questions. Here’s how answers to some of them shifted from 2014-15 to 2016-17. Note: From 2016-17 to 2017-18, district reports suggest that there wasn’t much further aggregate deterioration at elementary or high schools, but middle schools deteriorated substantially further across every single category. Sadly, it’s both telling and deeply disturbing that after two years of research, the commissioners’ case study to support discipline reform as one of its six pillars was — according to data they perhaps didn’t take the time to review — a horror story in the middle of a disaster zone. But these negative student survey results are a fairly consistent finding across school districts that have adopted discipline reform. To support its claim that discipline reform “often show[s] the largest positive effect for low-income students and students of color,” the report cites a 2016 literature review that admitted the research was “still in the infancy stage.” Since then, substantial academic harm for students of color has been documented in three out of four rigorous empirical studies (none of which made their way into the report’s endnotes). So, how could anyone be against social and emotional learning? Well, the thesis of the commission’s report could be boiled down to: For decades, we tried to improve reading and math achievement. It didn’t work and got really politically toxic. But now we have the solution: We just make kids better human beings. We definitely know how to do that! 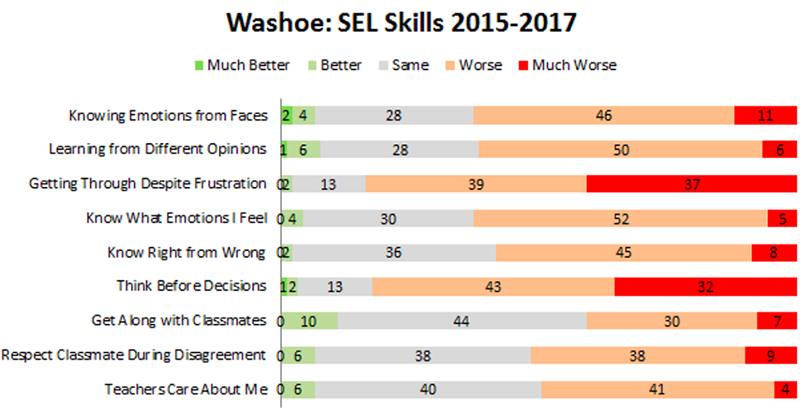 Something close to the worst appears to have happened in Washoe County, which, despite the horrible story its data tell, became the poster child for SEL’s success. And most everywhere else, where districts don’t collect school climate survey data, we may literally never know how much damage this new wave of reform causes. Max Eden is a senior fellow at the Manhattan Institute, specializing in education policy.